Have you ever heard this word? As for me, an Asian Food Channel’s lover, this word is so common that refers to a famous Singaporean’s Foodie – KF Seetoh. Back in 2013, He came to Indonesia for the many times and did some researches for some famous Indonesian’s eating places. 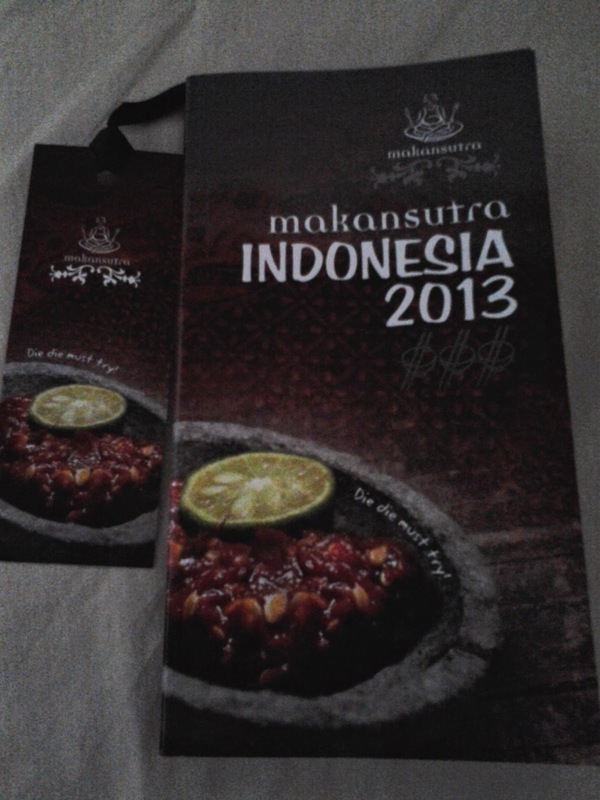 I reckoned at that time , He and Arie Parikesit ( a friend of mine) made this cooperation to publish a book names Makansutra Indonesia 2013. 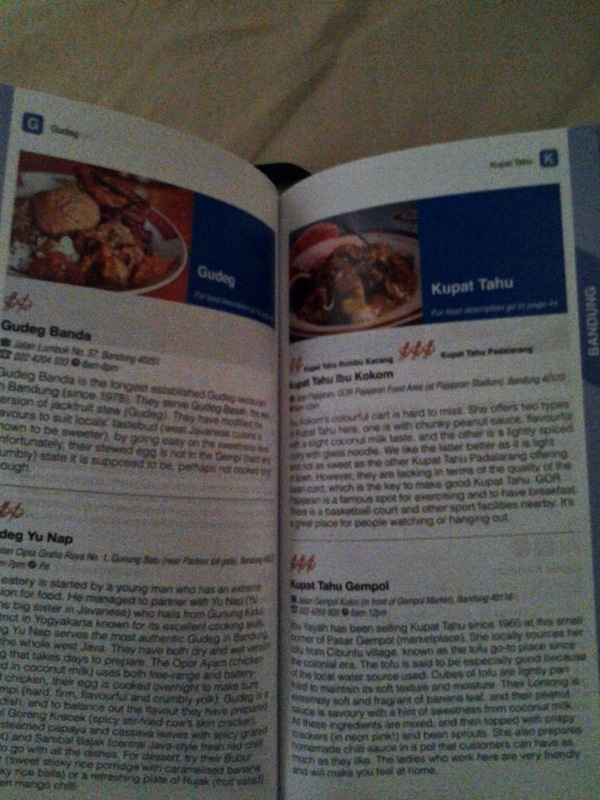 The book covers the eating places in Bali, Bandung and Jakarta(which includes Tangerang/Serpong). Actually I have bought this book months ago for around 150k rupiahs and I forgot to review it. As usual, the book arrived in my hand, opening each pages with excitement, then I kept it in my cupbard. That’s it! Till last week that I wanted to try eating in new places. Somehow, most those places written in the book covering central Jakarta – are the places I’ve known and been there for several times. Then I remembered how important to review this book. Why? Each references give detailed information on the location, phone number, opening hours, their closing days, halal/not, price range and how the bloggers rate the place in term of how delicious the food there. There are hundreds recommendation of eating places here. As for me, though sometimes no picture is shown but how the bloggers describe the food does make me drooling. The book itself comes in a handy size , which means one can easily brings it when visiting Bali, Bandung or Jakarta. How to buy this book? Just add Arie Parikesit in facebook or twitter. He will be more than happy to assist anyone interesting with this book and any questions related to food. 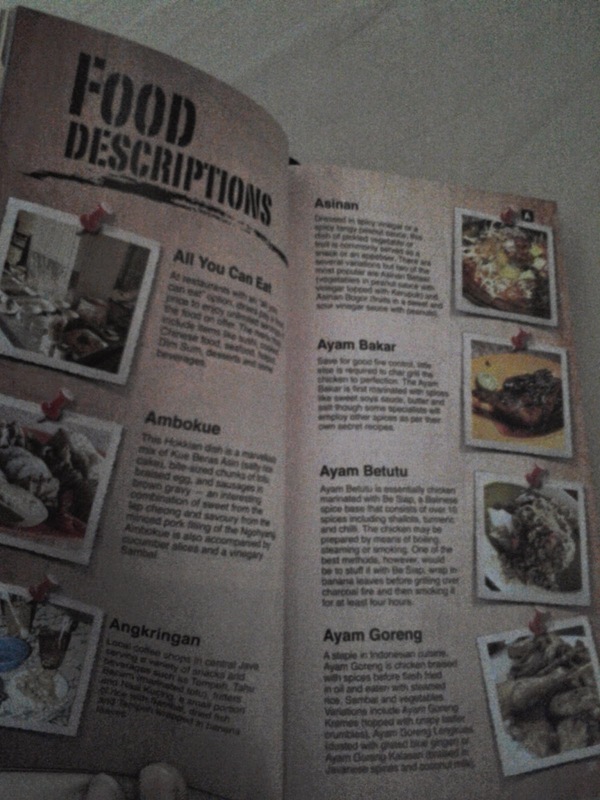 By the way, soon, Arie and his Warisan Kuliner’s team will launch a book of Indonesian Heritage food. This time, it will cover Indonesia from Sabang to Merauke. I am just too excited and can not wait for this book to be published. Why? Well, I follow him in twitter and he keeps tweeting of his journey. It is pathetic that you wish you can unfollow him but you just can not do that because you want to know more and more of Indonesian’s culinaries that you rarely hear.